Listen and order now from ArkivMusic, Amazon, iTunes, and other major retailers and digital outlets. Duo Scorpio, the world's finest harp duo, continues their ongoing mission to revolutionize the harp duo repertoire with Two Bridges, their ground breaking second release on the American Modern Recordings (AMR) label. This album follows their highly successful first album, Scorpion Tales, hailed as an album " likely to leave music makers and fans inspired to seek out more" (NewMusicBox), and described as a "diverse mix of new and recent compositions that push the limits of what can be done with the instrument" (Lucid Culture). Two Bridges includes a diverse collection of brand new works for two harps by an exciting and diverse group of composers, including Andy Akiho, Ferdinando DeSena, Christopher Dietz, Nico Muhly, Paul Patterson and Giovanni Piacentini. The entire album was produced from start to finish by Grammy winning producer and recording engineer, Adam Abeshouse. 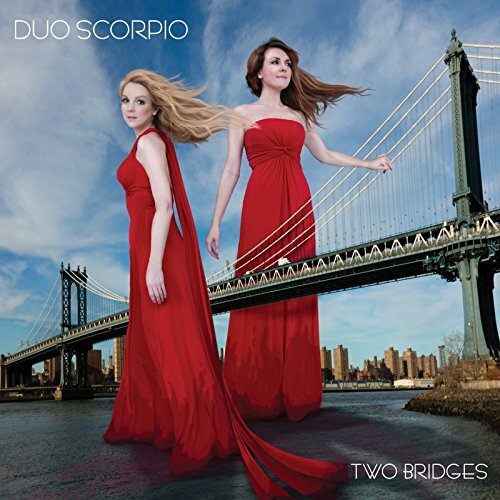 The formation of Duo Scorpio is as fascinating as the album: harpists Kathryn Andrews and Kristi Shade were born on exactly the same day, November 5, 1982, making them both Scorpios; they both moved to New York City after undergraduate school, completed their Master's Degrees at The Manhattan School of Music and studied with harp legend Susan Jolles. Scorpios are known for their determination, hard work and love of a challenge, which is definitely exemplified in this exciting second release. Further information: duoscorpio.com.